The police open fired pellet guns on the demonstrators near the site where two militants were neutralised by the security forces. 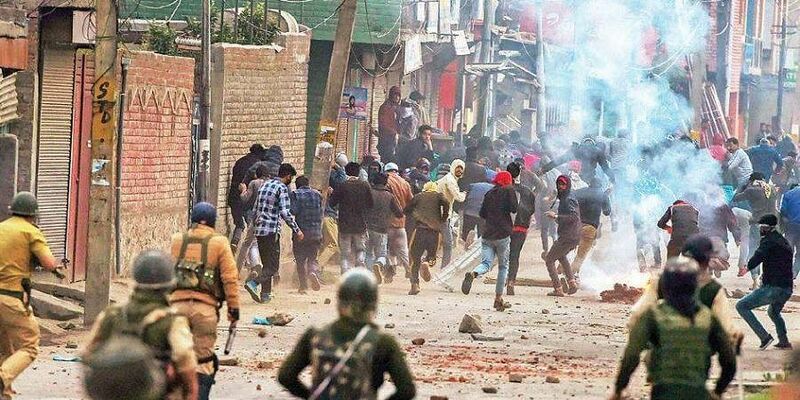 SRINAGAR: A youth was killed and 20 others were injured in security force action on demonstrators on Tuesday in Shopian, where two militants, reportedly belonging to Jaish-e-Mohammad (JeM) were killed in an encounter during a Cordon and Search Operation (CASO). Tamsheel Ahmad Khan of Vehil in Shopian died after suffering head injuries during the clashes near Kundullan, a police official said. Hundreds of people, mostly youths, hit the streets in the villages adjacent to Kundlan, where a CASO was conducted by security forces following a tip-off about the presence of militants early this morning. Raising slogans, the demonstrators also pelting stones, tried to move towards the area where the encounter between holed up militants and security forces was going on. Security forces and state police burst teargas shells and open fired, official sources said adding demonstrators were regrouping and pelting stones. Security forces later opened fire to control the mob, they said adding over a dozen persons had received injuries. The injured were rushed to hospital and some of them were later referred to Srinagar. One of the injured identified as Tamsheel Ahmad Khan, a resident of Vehil succumbed in a Srinagar hospital, they said.